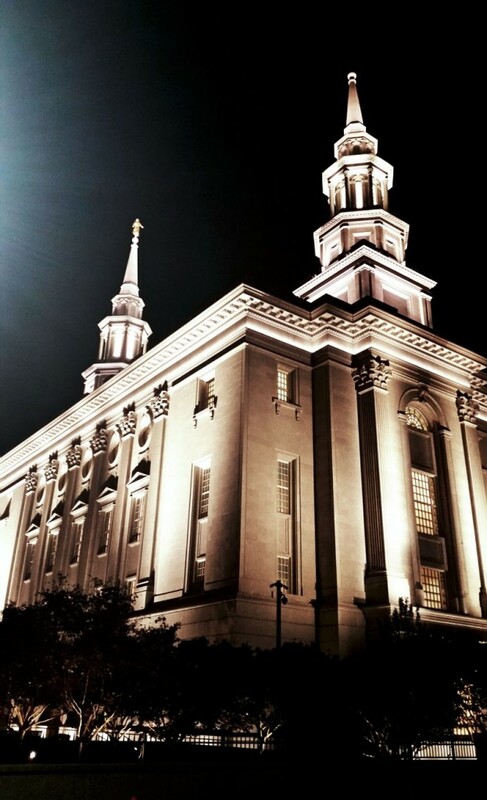 Clean, neat, and unused are the words I think when I think of the new Mormon temple downtown. Pristine. It’s by the main library. I’m inside on a tour, and the walls are covered in photo-realistic, figurative depictions of piety, biblical scenes, scenes of a Sunday-school nature. It harkens back to simpler time when there was no doubt, in America at least, of who Jesus was ethnically speaking. Mormons, if nothing else, are unabashedly white, which gives me the odd feeling of relief. I think it’s because this doesn’t have to be discovered over time. It’s the immediacy, you know what I mean. I mean, they must know that Jesus was a dark-skinned Jew with a Jew-fro who rabble-roused back in the day. But no. No, there’s Norse and German Yahweh and his similar looking flock–Ich bin der Weg die Wahrheit und das Leben (I am the way, the truth and the life, in German). To be fair, the children who slip plastic coverings on our shoes before we enter are of different ethnicities. And some of the paintings (prints) reflect this. I saw two. In a traditional sense the rooms are nice–maple oak floors, plaster moldings, samah marble imported from Egypt, luxurious balusters, and Deer Isle granite from Maine. It’s not avant-garde and so this isn’t quite a review, but it doesn’t lack any harmony with the old-timey surrounding structures. It blends. The members, though, leave me with an uncanny valley sensation, not that they’re androids, but I’m reminded of people from another place or time, a space of mind who are speaking in a newly acquired language of the quotidian, as if the pod has landed, and conversion ought to be accomplished. And this is not to say they’re creepy, but the benevolence I detect is not in fact a given, evident in their empathetic reality, but a result of inclusion itself, that we’re allowed to join. There were smiles, and I’m certain I can’t go on to say they were genuine or not, but they remind me of a flight crew after a flight lands: b-bye, b-bye. I smile anyway. As we circle around a Jacuzzi resting on the backs of twelve bronze oxen, I think, “This is relevant.” As the world becomes unwieldy to fathom, for some, and increasingly stressful to manage, a clean place with simple belief is attractive. Extremely attractive. It’s an option, and it can’t be taken lightly. A traditional roof, a façade we know, symbols that are baked into consciousness, a bedrock of universally accepted values is an option. There’s a main room whose name I can’t recall, but is doesn’t have a function. It’s domed to a degree, and the ceiling in it is high. A chandelier the size of a small car hangs in the center. It’s made of sparkling crystals. You can’t escape that fact. It reminds me of what I thought wealth looked like back when I was a kid. Personally, I think a room less ornate, a bit more minimalist is best for uninterrupted reflection. But that’s my opinion. I’m not against my blue-eyed brethren, but I see a theme here. The minorities added to the ten-minute orientation video are soft-featured, non-threatening, and assimilated. My guess is the blacks depicted are African, which doesn’t exactly pass the litmus test for social inclusion in America. I haven’t met many people with an African enemy, sub-Saharan nemeses, a burning dislike for ndombolo, I’m guessing, which is crude and comes from the same place I say leaves much to be desired in the way of reason in zealots. But I base this on the only black Mormons I see there in person, who are African. The other minorities are the ideal for a certain kind of mainstream fit. What I gather is an organization that wants to champion a certain kind of ideal and also break free from it—a crossroads. The sun finagles the cityscape out of all of its attention. It’s a late afternoon brightness that both looms and awes. It’d make a perfect cover for a pamphlet, or a still shot in a commercial for Zoloft. It’s balmy and windy and so I take my time to leave the sky terrace, down the stairs, away from the gray temple and its two spires, past a man on a megaphone who protests the ills of this church. Freedom of religion meets freedom of speech (grabs popcorn). Justin O. Walker is a writer and artist who lives and works in Philadelphia.